Work-life balance is not a new concept. It simply means carving out appropriate time for your professional and personal life. But lately it’s become a trend, with small businesses and startups using it to attract young talent, which has lead to defining exactly what it means for their employees. Often times, it comes down to how a growing company can achieve maximum productivity at a reasonable cost to their employees’ time and well-being. More recently, companies have been finding that productivity comes in different forms for different employees, leading to a revolution in what a normal work day looks like. We recently asked 17 CEOs, business leaders and entrepreneurs what their process is to achieve work-life balance. It turns out, it can take on many different forms. Check out how some business leaders blazed a trail for balancing life and work, and how their organizations benefited from it. Then, if you want to read more, check out these productivity trends. Lakshmia Marie, CEO of LMF Consulting Group, believes in setting expectations of when work is to be done helps boost productivity and retention. “In order to maintain a highly productive and happy workplace, we make sure that we have clear boundaries set up between us and our clients. Saloni Doshi, CEO of a growing sustainable packing company, EcoEnclose, began to notice that productivity was slipping, despite the long hours and hard work of her employees. “We’re lucky to have extremely dedicated employees who believe in our mission just as much as I do. As we’ve continued to grow, so have their roles and responsibilities. Naturally, stress levels also began to rise, and productivity decreased. We knew we needed to change how we worked in order to turn things around,” said Doshi. Saloni decided the best way to improve her employees’ restfulness and productivity was to enforce dedicated hours. Danielle Kunkle, Co-founder of Boomer Benefits, also instituted a mandatory leave time in order to prevent her employees from burning out. Kristin Baird, President and CEO of Baird Group, has many flexible policies for her employees. Kristin allows employees to work from home when needed, split their shifts to spend time with family, and allows working parents to leave on time. Amy Kilvington, Content Marketing Manager at Blinds Direct, takes advantage of her companies generous work location policy. Blinds Direct invests in employee technology so that they have everything they need to work remotely. Stuart Hearn, founder and CEO of Clear Review, requires his employees to attend a daily standup meeting, either in person or virtually, but otherwise employees can work wherever they’d like. Jen Salamandick, Strategy Director at Kick Point, notices a lot of companies have a flexible work policy, but often employees don’t take advantage of it. You can decorate your cubicles all you want, but there comes a time when the monotony of office scenery becomes a drag. Multiple studies show that workers can benefit from working out of the office from time to time. Whether it’s their local coffee shop, book store or their living room, sometimes getting away can be a boon for productivity. Neil Mclaren, owner and founder of Vaping.com, likes to give his employees that same flexibility primarily because he notices it improves productivity. Pau Kroger, Founder of Foxy Trades, noticed as they rolled out their flexible work hours policy their employee satisfaction skyrocketed. “This is something that we have been focusing on in our office. The way we try to do it is, we ask for people to spend at least half of the day in the office and choose where they would like to work from for the other part of the day. All we ask is that they need to make sure that all their tasks are completed,” said Kroger. Steven Picanza, Co-Founder of Latin & Code, has embraced technology as a way to foster a flexible hours policy for his employees. “By trusting your employees and allowing them the space to provide value and production on their time and terms as long as they are adhering to milestones and timelines, you can begin to promote an active work-life balance. We’ve stopped booking so many meetings and have allowed technology and processes to stimulate growth and in turn, a great culture,” said Picanza. “Need to work from home? That’s okay as long as you do what you’re supposed to. Need to leave early? No problem as long as you’re being efficient. Want to work from the bar? Don’t charge it on the company card and don’t let it show,” he added. Matt Collins, Owner and Founder of Loans Now, believes that vacation time should be treated as a means to increase productivity by companies and not as solely an employee benefit. Paige Arnof-Fenn, Founder & CEO of Mavens & Moguls, believes a healthy dose of physical activity does wonders for employee satisfaction and productivity, incorporating something employees would do after hours during work. Sabya Clarke, Virtual Reality (VR) Screenwriter and Director at Cinemagik, believes the nature of their work lends itself better to working remotely. “My team includes a VR producer, a VR technical director and visual effects supervisors, voice actors and more. Our cinematic virtual reality experiences as well as non-cinematic experiences are long-term and highly intense to make. Unlike your typical movie, there’s a lot of coding and more,” she said. Tim Cameron-Kitchen, Head Ninja & CEO at Exposure Ninja, used to have an office, but realized the company saves money and increases productivity when all of their employees work remotely. Nick Gray, founder & CEO of Museum Hack, similarly finds that the flexibility employees have of choosing their own hours and work locations empowers them to produce their best work and maintain a healthy balance between work and personal life. Kimberly Rath, Chairman and Co-Founder, Talent Plus, Inc. takes a unique approach to creating a work-life balance by including family in many work of her company’s events. “We include families in our work, starting on Great Take Off Day. All new associates begin on the same day each month and that day concludes with a celebration family members are invited to. They see where their family member works, watch their family member receive their Talent Card and meet their family member’s leader/team members,” said Rath. Yves Frinault, Co-Founder & CEO of FieldWire, likes to stick to what works when it comes to managing employee stress and responsibilities. “As simple as it sounds, we work very hard while we are at work. You sometimes think that as a startup, people would be running around with nerf guns or playing ping pong in the office, but it’s quite the contrary. We focus on creating windows of time where people can perform un-interrupted work,” said Frinault. Fostering a work-life balance for your employees requires a little creativity and discipline, but the results are more often than not positive. Making this a priority can increase employee satisfaction, productivity and company image. So, why not try some of the examples above and reap the rewards yourself? It’s key to productivity to have a happy workforce or you’ll burn out your most value resource. 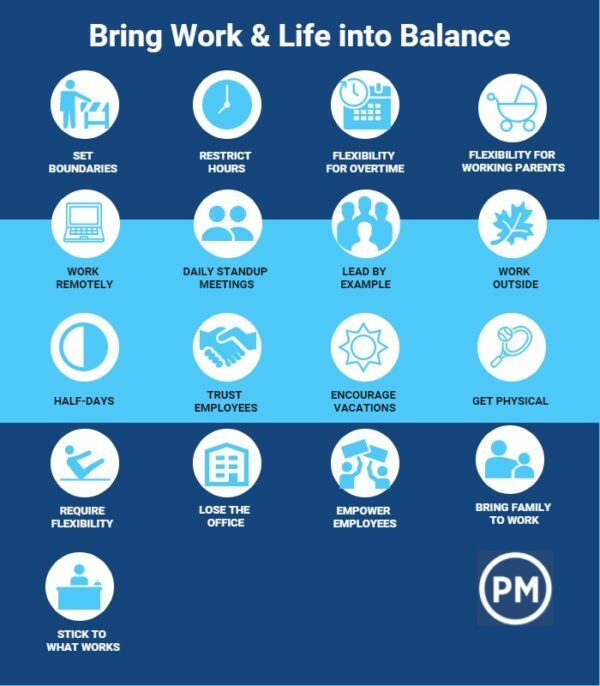 So, create a work-life balance and have the right tools to make sure when they are on the job, that work is more efficient. ProjectManager.com is a cloud-based project management software that gives your team the tools to collaborate in real-time, so they can get the job done right and be home for dinner. See how it can help by taking this free 30-day trial.